MUD GUARDS, GRAY, CLOTH & LEATHER-TRIMMED SEATS, CRIMSON RED, CARPET FLOOR MATS, CARGO MAT, BUMPER APPLIQUE, Wheels: 16" Alloy w/Full Covers, Variable Intermittent Wipers, UVO eServices 911 Connect Emergency Sos, Turn-By-Turn Navigation Directions. 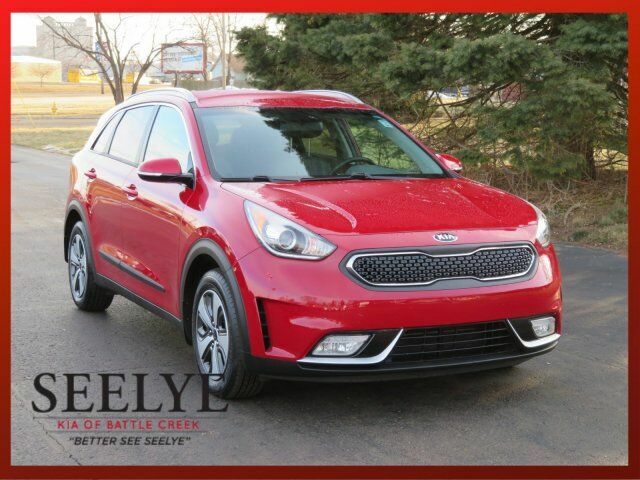 This Kia Niro has a powerful Gas/Electric I-4 1.6 L/96 engine powering this Automatic transmission. Trip Computer, Transmission: 6-Speed Dual Clutch -inc: Sportmatic shifting, Transmission w/Driver Selectable Mode, Tires: P205/60R16, Tire Specific Low Tire Pressure Warning, Tailgate/Rear Door Lock Included w/Power Door Locks, Strut Front Suspension w/Coil Springs, Streaming Audio, Spare Tire Mobility Kit, Single Stainless Steel Exhaust, Side Impact Beams, Roof Rack Rails Only, Roll-Up Cargo Cover, Remote Releases -Inc: Power Fuel, Remote Keyless Entry w/Integrated Key Transmitter, Illuminated Entry, Illuminated Ignition Switch and Panic Button, Regenerative 4-Wheel Disc Brakes w/4-Wheel ABS, Front Vented Discs, Brake Assist and Hill Hold Control, Redundant Digital Speedometer, Rear Cupholder, Rear Child Safety Locks, Radio: AM/FM/MP3/SiriusXM Audio System -inc: 6 speakers, Bluetooth wireless technology w/steering-wheel-mounted audio controls, UVO eServices w/7" touch screen, Android Auto, Apple CarPlay, USB and auxiliary input jacks and USB charger outlet. KBB.com 10 Best Hybrid Cars Under $40,000, KBB.com 10 Most Awarded Brands.